The Astoria Scandinavian Midsummer Festival features three days of some some of the best entertainment of the year! 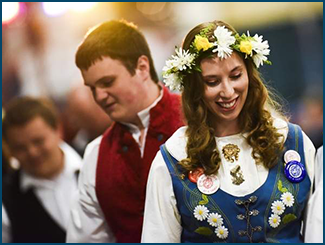 Singers, musicians, and dances from around the globe come to Astoria to celebrate our Scandinavian heritage! Below are some details about each of the exciting performers that await you at the 2019 Scanfest! Harald Haugaard is one of Denmark's best musicians. He has won the Danish Music Prize twelve times and is very well-known abroad, particularly in Germany. Helene Blum has taken Danish folk music to a whole new level. Her inventive, contemporary interpretation of traditional songs reveals their timeless beauty. This musical proficiency coupled with her expressive voice have brought her high acclaim in her native country and also enabled her to captivate enthusiastic audiences elsewhere in Europe, the USA, Canada and Japan. After years of touring in Europe and North America with their band and performing hundreds of concerts together, Harald, Helene and the band members have forged a close relationship, both musical and personal, where all are involved in shaping and arranging the music. The Harald Haugaard / Helene Blum Band is returning to Astoria, one of their favorite places, to entertain 2019 festival goers with contemporary folk music from Scandinavia. Band members include Kirstine Elise Pedersen on cello, Mikkel Grue on guitar, and Sune Rahbek on percussion. Catch all six of the performances if you can! 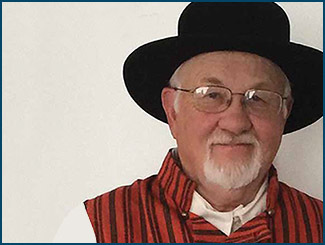 Learn more about Harald Haugaard - Click here and Helene Blum - Click here. 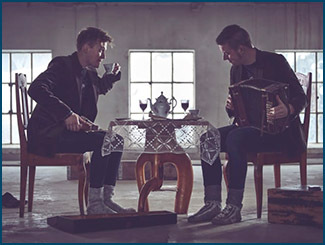 It’s long been tradition in Norway to combine fiddle and accordion in folk music. Bjørn Kåre Odde and Ole Nilssen have strong skills on their respective instruments and know the traditions well, but their music together is innovative and imaginative and pushes tradition to the boundaries. These young musicians have a light, playful and dynamic interaction that appeals to dancers and concert audiences equally. In 2017 Bjørn and Ole placed second together in the national competition of round dance music and separately they were each named Young Folk Musician of the Year in 2015 and 2018 respectfully. 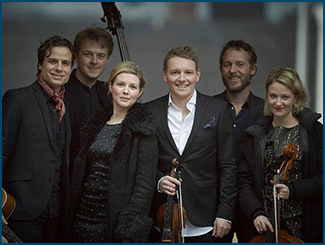 Enjoy listening to updated traditional and original tunes by some of Norway’s finest new and upcoming musicians. Learn more about Bjørn and Ole. Click here. Astoria Scandinavian Heritage Park will honor the immigrant tradition that brought thousands of Scandinavians to Oregon’s North Coast in the late 1800s and early 1900s. It will be a public space to make locals and visitors alike aware of the ethnic heritage that contributed immensely to the fabric of our community. It will honor families that said their last good-byes in Scandinavia and moved to Astoria to become Americans. Astoria Scan Park Committee Chair and Astoria Scandinavian Heritage Association Vice-President Judi Lampi will describe the fantastic design for the park created by the West Studio of Seattle Washington and detail the timeline and progress of the effort to raise one million dollars to pay for its construction. Learn more about the Astoria Scandinavian Heritage Park. Click here. Now in its 34th season, SHANGHAIED IN ASTORIA, is part-vaudeville, part-soap opera, and part 1950’s style Hollywood musical, all combined into a fun and entertaining look at traditional local cultural folklore, including immigrant cannery workers from Scandinavia. What originated as a celebration of Astoria tradition has become a tradition itself and you don’t want to miss it! Catch Shanghaied cast members performing their olio acts in the beer garden at festival on Saturday. Learn more about the Astor Street Opry Company. Click here. Finlandia Foundation Lecturer of the Year Frank Eld is the son of a Finnish immigrant carpenter and loves the lost art of Finnish log cabin construction. Through visuals and live demonstration, Frank will educate and encourage the preservation of these tangible symbols of Finnish Culture, like the historic Lindgren Cabin at Cullaby Lake. 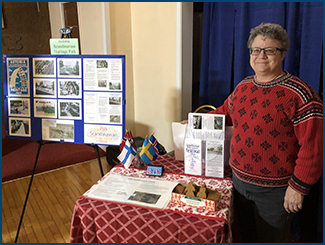 Eld’s appearance at the 2019 festival is sponsored by Finnish Brotherhood and Finlandia Foundation: Columbia Pacific Chapter. Learn more about Frank Eld. Click here. 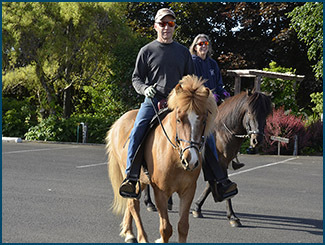 Jackie and Larry Taylor of Yelm, Washington will show their Icelandic horses in the horse arena in the low building next to the Midsummer Pole. Icelandic horses are a pure breed that developed in Iceland. The horses are mostly pony-sized but are still called horses. They are short backed and can carry a two-hundred-and-twenty-five-pound man. They are long-lived and hardy and have unusual gaits. Jackie and Larry will provide demonstrations of these attractive animals and let you see them up close. The Taylor family will be close by for any questions either in the arena or in the barn. “Leikarringen” means circle or round dance. The priority of this group is the preservation of Nordic culture. LEIKARRINGEN OF PORTLAND is open to youths ages 4 and up. New dancers begin each year while some have danced for fifteen years or more. This long dance tradition is rich with tunes and steps from Norway, Sweden, Denmark, Finland and even Estonia. Dances are generally fast-paced and a recent addition to Leikarringen has been their own group of musicians who perform on traditional instruments. LEIKARRINGEN is led by Christie Stilson and Darcy Andrews and is sponsored by the Daughters of Norway and Norske Runddansere. Learn more about the Leikarringen of Portland. Click here. 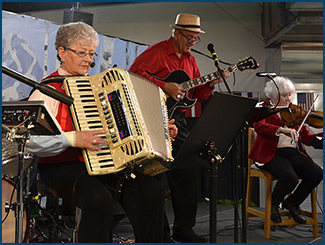 The Polka Dots formed in the Fall of 2018 at the suggestion of Astoria’s veteran accordionist Coreen Bergholm to provide live traditional music for the Fort George Benefit Night for Scandinavian Heritage Park. This North Coast Combo whose members are all of Scandinavian heritage has special enthusiasm for Northern European dance music. Members include Nancy Word and Ruby McCord on accordion and Noel Rydbom on string bass. 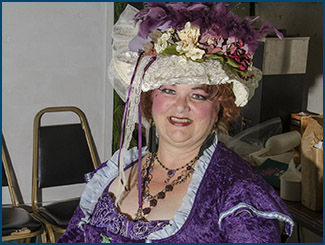 ChrisLynn Taylor of Astor Street Opry has taken a script by Norwegian Stina Fagertun and reworked it into a Readers Theater presentation with local actors and actresses. Learn the heartbreaking story of what the Scandinavian immigrants left behind when they came to America and their hope for the future and what they found in the new world. Returning for the Queen’s Ball on Friday evening after the Coronation will be local favorite Coreen Bergholm and her band, Scandinavian Country. 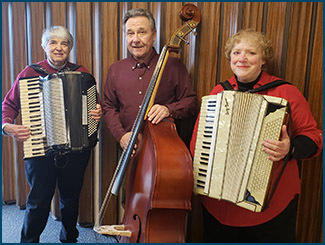 Coreen learned to play accordion in an immigrant community in North Dakota and now spends winters performing around Yuma, Arizona, where she met Ken, the tuba and trombone player. This is the band that plays the local favorite dances like the Varsouvienne, the Butterfly and the Irish Waltz as well as polkas, schottisches, waltzes, and hambos. They even play the Chicken Dance and the Hokey Pokey! Learn more about Coreen Bergholm. Click here. Coreen Bergholm learned to play accordion in an immigrant community in North Dakota and now spends winters performing around Yuma, Arizona, where she met Ken Presthus, tuba and trombone player. This duo is back after an absence last year and we know you will enjoy their music and shenanigans in the beer garden. The EMPIRE OF CHIVALRY AND STEEL specializes in the recreation of the culture of the Middle Ages, including the art forms, events (feasts, tournaments, ceremonies and wars), and combat arts from that period. The purpose of this nonprofit educational corporation is to study (and teach the general public) ideals and history from 800 AD to 1650 AD within the geographical boundaries of Europe and to provide an organized effort in the collection, interpretations and distribution of historical data through publication and demonstration. 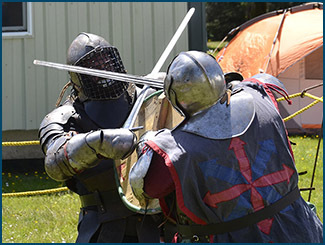 Empire of Chivalry and Steel participants will open their Viking Encampment to the public on Saturday and Sunday and provide demonstrations of Viking sword fighting and amour making on both Saturday and Sunday afternoon. Learn more about the Empire of Chivalry and Steel. Click here. Astoria’s own dance group includes dancers from second grade to adults. The NORDIC DANCERS are the youngest group and several members are performing at their first midsummer festival. Experienced teen-age dancers make up the VIKING DANCERS but several fathers also participate . This group is always open to new members! 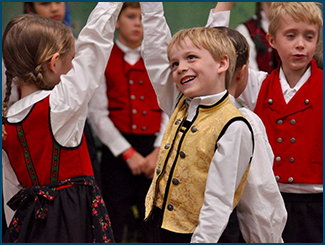 Parents of dancers and former dancers and adults interested in Scandinavian folk dancing form the SCANDIA DANCERS. The Nordic Viking Dancers are led by Kevin Ladd. Learn more about the Nordic Viking Dancers. Click here.